Lys and Lyn strutting their stuff at the Eden Roc Hotel (Miami Beach, Florida) in 1958. Five more photos of Lys and Lyn in action over at What Makes the Pie Shops Tick? 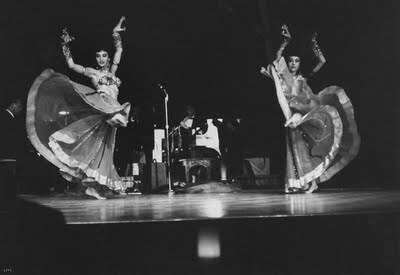 Lys (sometimes Liz) and Lyn Gamal were twin sisters from Cairo who became a major sensation on the American cabaret scene in the 1950s, and a significant influence on many American dancers of the era (notably Morocco and Dahlena). They had forged a modest career in Egypt as featured film dancers. According to Helen Waldie over at Belly Dance History, they are "fondly remembered, especially for the fact that their parents chaperoned them to every one of their gigs, even after they married." As a wee extra, here's a great interview with Morocco, friend of Lys and Lyn, from Casbah Dance.